1. Did your early life give you an introduction to the world of plants and flowers? "I grew up in a gardening family. We had large perennial gardens and a good sized vegetable garden, which I was tasked with keeping weeded as a youth. Mom (Diane) loved almost any plant and was not particular about what was in the gardens. Dad was always looking for the exotic and was interested in trying new plant introductions. Family vacations and trips often revolved around visiting nurseries and botanic gardens, which I found very interesting and certainly set the seed for plant passion. In the late 1960's a friend of the family got my father and I interested in tropical orchids. We began buying and collecting plants that were grown under lights. By the time I was in 8th grade we had built a small greenhouse, which was attached to our garage, to house the orchid collection. During the summer of 1976 we took a summer vacation with a van towing a 26 foot house trailer to Mexico-the goal was to collect wild orchids. We collected hundreds of epiphytic orchids from the southern cloud forests of Mexico, which we imported into the U.S. and grew in our greenhouse. Some of the orchids were unidentified species at the time and were very interesting to the orchid world. The orchid 'bug' stayed with me through college and up to the 1990s, at which time I became interested in daylilies." 2. What year did you start hybridizing? "Just after getting married to Kim (my best half) in 1983, I began hybridizing Phragmipedium orchids. Hybridizing orchids was not unlike working with peonies in that it takes a good 5 to 7 years from seed to see your results. Unfortunately the seed of orchids had to be sent to a lab for germination and early development, which was always problematic. The labs often mishandled, mislabeled or would do poor work growing the plants. Getting good product from the labs during that period of time was challenging and often disappointing. My best hybrid (Phragmipedium 'Nate Bremer') was a cross of Phragmipedium 'Mary Bess' x Phragmipedium caricinum. It was registered, propagated and distributed after I had hung up hybridizing orchids. All in all, the orchid hybridizing experience was a great experience to work with other plants that were hardy for our area." 3. 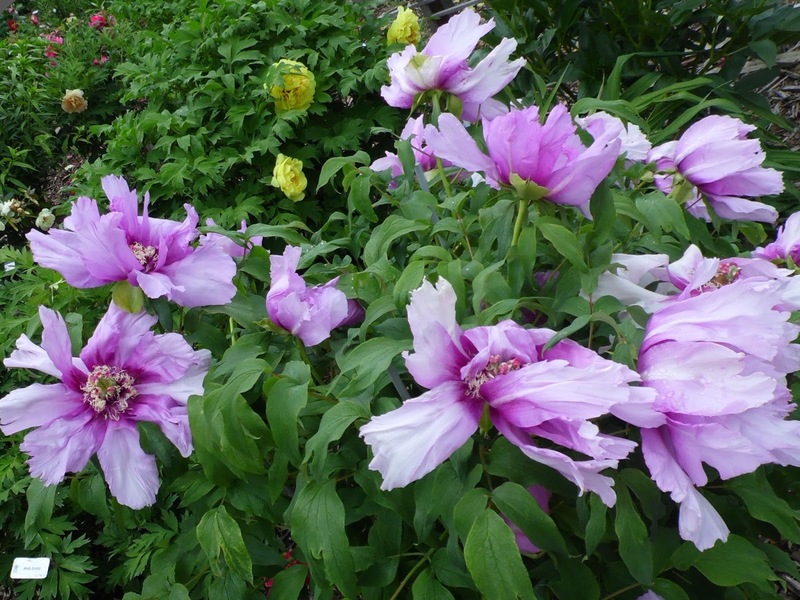 What made you want to get into peony hybridizing? "Next came daylily hybridizing, which I still do today. Hemerocallis (daylily) are selectively hybridized worldwide on a large scale with thousands of new introductions made yearly. Advancements within that genus made large strides during the 1990's to 2000's, but now have stagnated somewhat. There is still much work to do with in the genus, but progress is slower. Once I started growing peonies and became familiar with the hybrids, I could see many new possibilities. The possibilities were like looking out on a new frontier, and exploration of the unknown was certainly a driving factor that led to my interest in breeding them." 4. Are you self trained, or have you taken classes or read books on hybridizing before you started? "People often ask: 'Where did you learn how to hybridize?' Like almost all hybridizers it was one borne from interest and not one that was a vocation. Initially, I went to college and enrolled in a plant science program. After a couple of semesters of work within the program it became obvious that future money making potential within the area was not likely to be good. With this in mind I changed my major to science education and directed my efforts to teaching. Learning to selectively hybridize plants and animals was well supported by genetics and biology classes and only a little imagination was needed. Reading books by other hybridizers and making close observations of my own plants, as well as others, was good training. Getting to know other hybridizers (Bill Seidl) was very helpful and led to many good discussions of the possibilities and barriers. I'm not aware of any one definitive 'How to Hybridize Peonies' piece of literature that would answer all the questions. The unknown and learning the habits of the subjects being worked with in my garden is one of the most rewarding, if not surprising aspects of hybridizing. If you aren't willing to experiment and fail, hybridizing probably isn't a good activity for you." 5. How would you characterize your breeding program? "My hybridizing program for peonies is all over the place. I'd characterize it as a program that focuses on advanced generation hybrids-one that works primarily with plants that are F3 or later. While big 'breaks' can be made in the earlier generations, advanced generations tend to focus on refinements in the flowers and habits of the plants. After some good years of production, it has become obvious that greater genetic diversity may be needed, drawing from earlier generations, to make solid gains with the advanced generation plants. For instance, very few hybridizers ever worked with creating lutea hybrids (Saunders, Reath, Daphnis, Lemoine and Henry). Of this group of hybridizers only the first three in the list have produced hybrids used in advanced generation lutea hybrids. 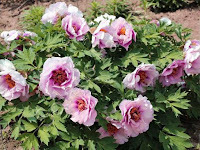 The primary hybrids or first generation plants mostly came from a very few Paeonia delavayi and Paeonia suffruticosa hybrids found within these hybridizers collections, making genetic diversity in the group very limited. Obviously, new P. delavayi and P. suffruticosa cultivars brought into this group would increase genetic diversity and perhaps produce more desirable traits in our hybrids. I'd like to produce more of F1 hybrids to enhance what is already available." 6. What kind of peonies do you specialize in? "The focus of my hybridizing program in mostly advanced generation lutea hybrids and herbaceous hybrids. While I love lactifloras and some of the new intersectional crosses, I don't have the time and space to work with these groups. 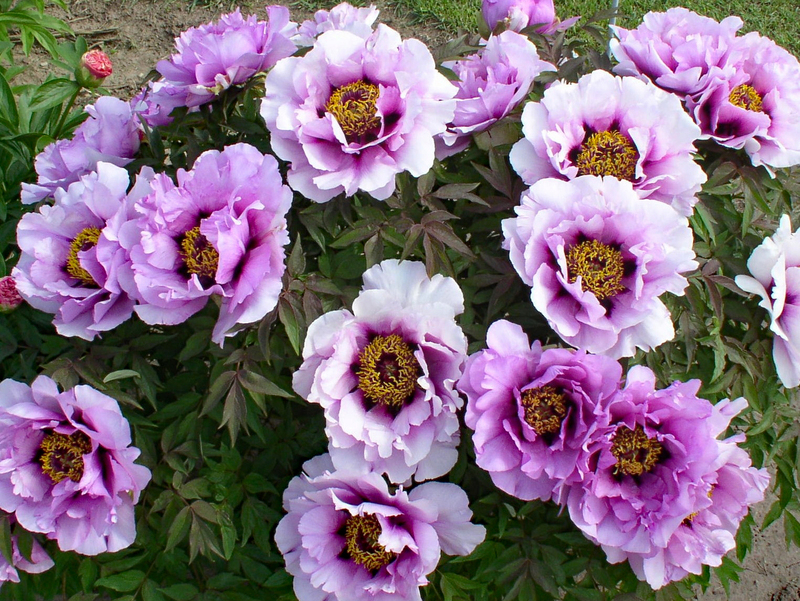 Woody peonies (tree peonies) are of special interest due to their wide and varied plant habits and flowers. Specializing in these plants allows me a large collection of goals to work with and the upside is great. 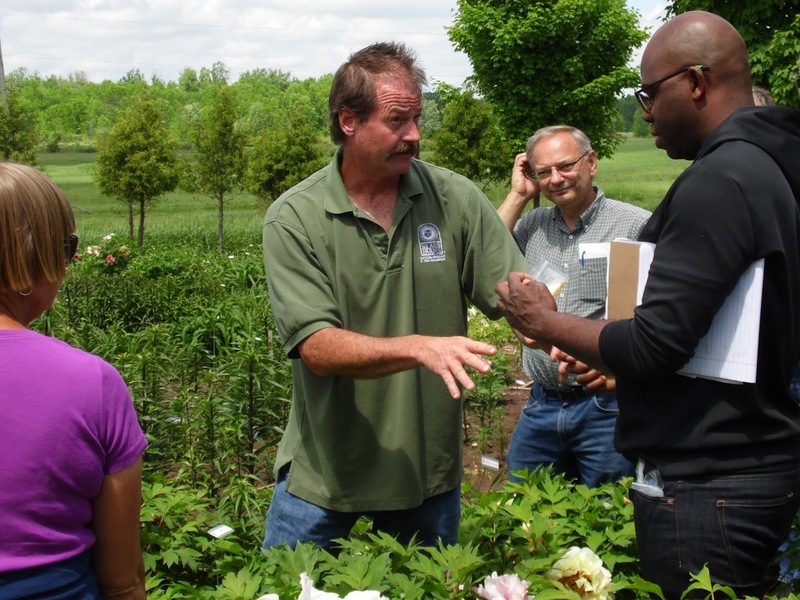 Producing woody peonies that will grow well in our northern continental climate zone is challenging, but also needed for this group of plants. While woody peonies can be grown here successfully, many of the available cultivars are challenging and are not the best choices for our gardens. Producing new hybrids better suited to the northern part of the United States is certainly something that is appealing." 7. How has your "eye" for evaluating peonies changed over the years? "Probably like many people, when I first began hybridizing, my concentration was on the beauty of the flower. Over time the plant habit became more important, and today that aspect now over shadows the flower. Because peonies are in bloom for such a short period of time, I now want plants that have good foliage, are disease resistant and have strong stems (that present their flowers nicely during bloom)." 8. When you look at a plant as an experienced hybridizer, what do you see? "As I've gained experience one of the first things I look for in my plants is consistent strong wide stems (this works for both woody and herbaceous plants). Strong wide stems support flowers well. A plant that consistently grows with this habit often looks better in bloom. Many hybridizers want fast growers, but I think that is more of a marketing desire than one that is focused on quality. A preference for plants that have solid growth habits outweighs almost everything else." 9. When you evaluate your seedlings, what are your major criteria? "Double formed flowers with good stem strength is certainly a goal, but so is leaf form, color and floriferousness. Woody peonies that are tall in plant habit (in the north) is something I'm working on, but so are mounded-low growing plants. These plants should be productive bloomers and have double flowers of good color. Leaves that are deeply cut and are present from the ground up is also something that is pleasing. All of these goals together are a tall order, but progress is made with each generation and choosing parental material with these traits often produce better plants in the next generation. 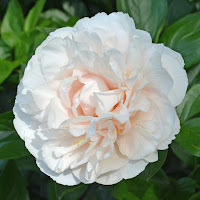 I suppose that my aspiration is the perfect peony, but that is probably different for each hybridizer. Culling seedlings that miss the mark on plant habit, even if the flowers are nice, is a difficult task. I found that making the decision to cull became easier when the bad plant habit peony seedlings began to block the rows in the field, impeding my ability to work in the area. In the past we used to sell seedlings, but now avoid putting plants in other's hands that may have a flaw that I can't live with." 10. What are your aspirations for the future of peonies? "In the future I'd like to see peonies more widely grown and in greater numbers in people's gardens. To accomplish this a great deal more education and introduction is needed for gardeners to embrace the plant. 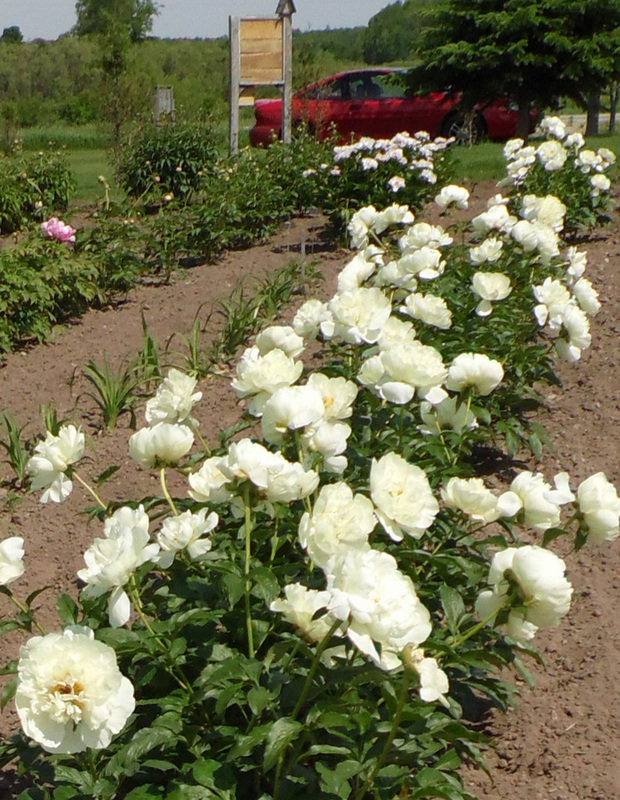 New peony cultivars need to become more disease resistant and better cultivars need to replace the more commonly sold cultivars. I think the APS is on the right track with its listing of Award of Landscape Merit plants. 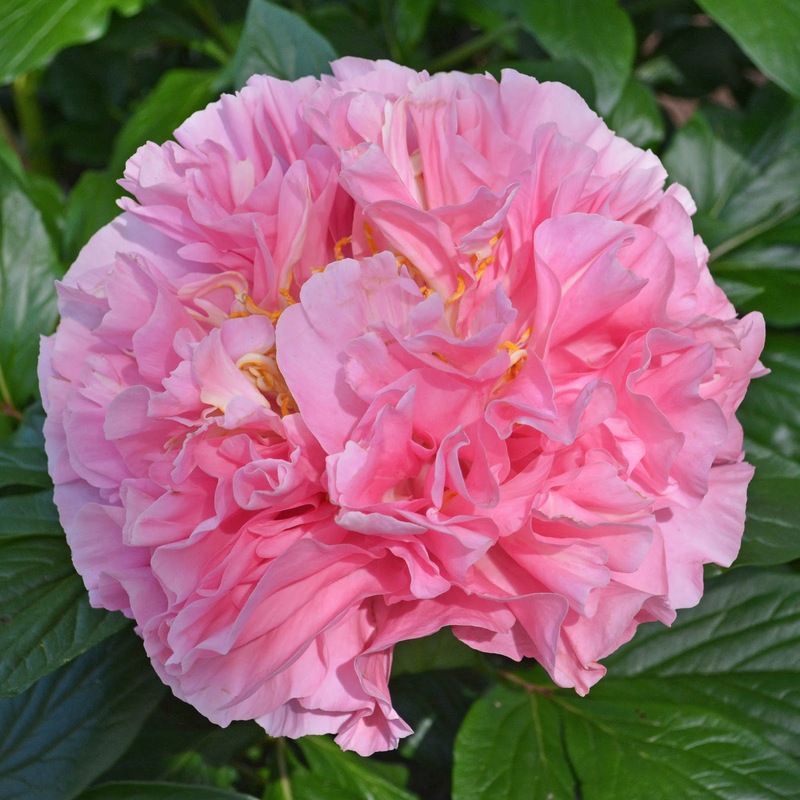 If the American Peony Society can become more visible to the gardening world, I think the peony can make great gains in gardens." 11. What is your favorite named and registered cultivar so far (of your own) and why? "I'm very much a new comer to the registration of peonies and have not registered many of my own creations to date-that takes time. Bill Seidl introduced me to peonies in the summer of 2000 (I didn't really like peonies at that time-due to ignorance). Bill had registered a number of cultivars prior to meeting him, but was no longer interested in that process. He continued to hybridize, and he had a good number of plants worthy of registration. We began a discussion about getting these plants into commerce and registering them. Thus many of the plants that I've registered are Bill's originations. My own hybrids are now creeping into the registration process, and I'd have to say that my favorite to date is the woody peony 'Copper King' (registered in 2016). Copper King is a semi-double advanced generation lutea hybrid with coppery orange color scheme. The plants have good foliage and good stem strength. It has done well in our climate and flowers are unlike any other in the garden." 12. Which of your peonies are your oldies but goodies? "Picking favorites has always been difficult, but there are those that stand out. Woodies from other hybridizers that I very much like include Saunders' 'Age of Gold', Daphnis' 'Hephestos' and 'Pluto', Seidl's 'Fuchsia Ruffles' and 'Angel Emily', 'Rosy White Clouds' and a number of other white double rockii lineage plants, 'Lavender Hill', 'Theresa Ann', and 'Golden Mandarin'. Typically the woody peonies that are not in favor are culled, so most things that are found on my website are acceptable or very much liked! Herabaceous hybrids are another passion, and some of my favorite oldies would be: 'Minnie Shaylor', 'Old Faithful', 'Pastelegance', 'Pastelorama', 'Vanilla Schnapps', 'Chocolate Soldier', 'Viking Valor', 'Abalone Pearl', and 'Dreamtime'. Most of these probably don’t fit into the 'old' cultivar category, but they are what I like the most. 'Bartzella', an intersectional, is also a plant that I think is superior." "I don’t grow many lactifloras since they don’t typically fit into my hybridizing program for various reasons. One plant that has been with me, my father, and grandfather is 'Edulis Superba' and will remain. 'Edulis Superba' has beautiful, fragrant, double flowers perfect for cutting. Its real allure for me is the rootstocks that it produces. This old French hybrid has survived for more than a hundred years in many gardens and probably has endured much neglect. The plant is vigorous and produces highly disease resistant roots, which are perfect for grafting woody peony scions to and is likely the reason the cultivar has survived in so many gardens! 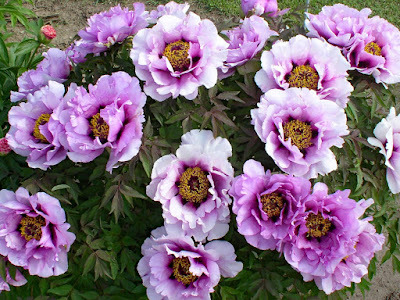 For grafters, it is an easy grower, woody peony scions easily join with it, and it is not adventitious! Perfect." "From a hybridizer stand point, I get excited about plants that others may not find so appealing. I really like 'Manchurian Promise', a woody peony, registered in 2016. Flowers are semi-double of apricot/salmon on top of a yellow base. The plants are very consistent growers and have good seed fertility. From a hybridizing stand point, it is difficult to find good seed producing lutea hybrids of good quality. 'Pastelorama' an herbaceous hybrid, that we registered in 2013, also get high marks. 'Pastelorama' is a very large flower of dusty pink/rose that has been a very good parent for quality semi-double and double flower forms." 13. Which of your new and/or upcoming registrations are you most excited about? "I’m really excited about my own introductions/registrations and think they will be great additions to anyone’s garden. At this writing there are 5 of my own registrations on the books: 'Aegean', 'Copper King', 'From the Deep', 'Manchurian Promise', and 'Wisteria Reflections'. I register a number of Bill Seidl’s worthy seedling each year as well. In 2017 there will be 5 more of my own woody registrations, but they still need to go through the APS registration process. I think this is another great group of plants." 1. Woody peony 'NB-SH91': A seedling from a cross of 'Pluto' x 'KC Red'. 'Pluto' seldom produces seed, but if you can get a seed or two a year and grow them out, the product is often very good. In this plant’s case the flowers are a single red, very nice, but not a knock your socks off flower. However, the plants have a very upright habit and have very winter hardy stems-something that is very much needed in advanced generation hybrids. To top it off this plant is the most fertile of any advanced generation lutea hybrid plants that I grow and suspect anyone grows. Seed fertility in this group is often poor, but ‘NB-SH91’ will almost always produce full carpels of nice black round seeds that are easy to germinate. I have yet to see flowers from the seedlings, but have high hopes for carrying on the good characteristics of this plant. Registration of this plant is a way off due to its use in hybridizing. 2. Woody peony 'NB-SH95': is a semi-double red from a cross of 'KC Red' x 'NB37'. The flowers are an interesting shade of red and have much crimping and fine ruffles. It often produces 3 buds per stem and has exceptional carriage. I love the flowers, but the foliage is remarkable-finely cut and more fern-like than any others that I grow. Many of the F1 lutea hybrids have similar foliage characteristics, but not the overall appeal. 3. Woody peony 'NB6': A seedling that has been slow to develop, but for the last couple of years has really shown superior flowers and plant habits. The plant may have shown its true capabilities earlier in its life had it not been transplanted twice and moved to a less than perfect place at the farm. The flowers are very large (9 inches) and are a smoky lavender with outer petals that fade to a light lavender cream (inner petal stay darker). It’s a double flower and often has 3 buds per stem. Carriage is outward, but doesn’t face down. This will be named for Kris Casey, a long time garden friend. This is certainly one of the best plants in my garden-my opinion. 4. Woody peony 'NB-30': A cross of ('Garden Sunshine' x ('Sedona' x 'Rosalind Elsie Franklin'). This is a big semi-double yellow that surpasses all the other woody yellows for color, plant habit and flower size. 'NB-30' was a very popular pollen donor at our hybridizing workshop held this last June. I don’t think any of the flowers had any stamens left after the workshop! 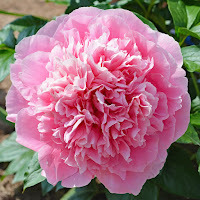 There are many other woody peonies that could be included in my list of favorites, but since the seedlings number in the 1000’s now, it would be pointless. A new group of favorites will probably take this one’s place next year, or at least be added to. 5. Woody peony 'NB-8': An advanced generation lutea hybrid from a cross of 'Fuchsia Ruffles' x Seidl #144 ('Harvest Peach'). It was awarded a certificate of merit at the 2016 APS flower show. NB8 has been a very good seedling for us and is one that will be registered in the future due to flower and plant quality, plus I like it a lot! Flowers range from semi-double to double, depending on year. Petal color is lavender with dark flares (which are not visible when flowers are double) and they have nice uniform ruffling throughout. Plants are large mounded specimens that have beautiful foliage to the ground and the flowers are carried around and on top. A good vigorous grower that has proven very good in cold Wisconsin. This and many other advanced generation lutea hybrids or ours are really beginning to show their mature beauty. I’m so glad that others at the APS flower show thought highly enough of it to award it a certificate of merit!" 1. 'NB-H78' a semi-double pink from a cross of 'Old Faithful' x 'Pastelorama' has been stellar. This plant has outstanding flower carriage and deep green wide foliage. It also won the best seedling award at the 2016 APS flower show. 2. 'NB-H85' is a very big double white with a pink blush. A cross of 'Manitowoc Maiden' x 'Pastelegance'. This big plant attracted a great many happy viewers at the 2016 APS garden tour. 3. 'NB-H34' is a huge medium pink double that I can’t wait to release, but needs a few more years of growth before it is ready for other’s gardens. 'NB-H34' is a vertically challenged plant that has very strong stems that carry the massive flowers very well. It has the largest flowers of any peony I grow. 4. 'NB-H100' is a pink-red semi-double to double of unusual form. A cross of 'Little Corporal' x 'Manitowoc Maiden', 'NB-H100' has flowers that open rather flat and as it ages becomes columnar. Gorgeous deep green foliage clothes the rather short plants." "To date I’ve registered three of my own herbaceous plants: 'Europa', 'Necromancer' and 'Red Hot Babe'. The remaining registrations in this group are Bill Seidl’s creations that he wanted me to register. There will be a few more of Bill’s herbaceous plants that will be introduced when numbers of plants allow. This year I’ll introduce 5 more of my own herbaceous hybrids. Again, these need to go through the APS Registration process." "The 2016 APS convention, held in Green Bay, this past spring was the first opportunity to show our hybridizing program off to society members. 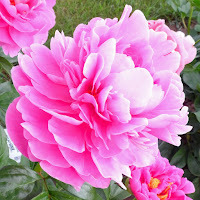 It was the first time I had ever shown peonies flowers, and it was a great experience. We entered quite a few woody peony seedling flowers and came away with 6 Certificates of Merit (one was 'NB-H78', which took the best seedling award). What a surprise and honor!" "The new woody and herbaceous hybrids will be available for viewing on our website on January 1, 2017 and I’m looking forward to hearing what people think of them." 14. What is the story behind the first peony you ever registered? "The first peony we registered wasn’t just one, but a group of Bill Seidl's plants that were of great quality. That group was registered in 2013 and contained: 'Pastelorama', 'Angel Emily', 'Captain Kate', 'Little Corporal', 'Juliska', 'Theresa Anne', 'Sedona', 'Dreamtime' and 'Vanilla Schnapps'. Since all of these were originated by Bill they all have their own stories that are personal to Bill. This was a really good group of plants that had, in many cases, been selected over a very long period (20 years+) in Bill’s gardens and then in Solaris Farms’ fields. Bill was interested in propagating and distributing them, but wanted them in other’s gardens, thus I was glad to do so. 'Angel Emily' was a plant that was very appealing to me in 2000 and remains so today. It is woody rockii hybrid from a cross of 'Rock's Variety' x 'Schintenchi'. I was awe struck upon seeing it in Bill’s garden in 2001. The thirty year old plant had more than 100 flowers evenly displayed across its 8 foot wing span (6+ height). Being a rockii hybrid it has the dark central flares that often are found in this group of hybrids, and the foliage is made up of many fine leaflets. The plant has been photographed with many peony people that have visited Bill’s gardens over the years and serves a wonderful record of both plant and people. In the 1990’s Bill met Kris Casey and her young family. The Casey’s would often come to visit Bill, and one of Kris' daughters (Emily) took a liking to the plant. Thus the plant was quickly dubbed 'Angel Emily'. Emily herself is quite an angel. Interestingly, Roger Anderson made the same cross the very same year and registered a plant from the cross called ‘Angel Choir’. Both are extremely floriferous and quite beautiful." 15. What is the average length of time you evaluate a peony before you put it on the market? "Evaluating seedlings can be a long process or a fairly short one, depending on growth rate and climate conditions. From the year 2000 to 2010 our area of the country had periods of severe drought, inconsistent snowfall and above average temperatures. These conditions were not good for evaluating seedlings for registration purposes and certainly not for plant growth. We don't irrigate or protect our plants in any way. Thus we get a true view of how a plant does in adverse conditions. During that period of time evaluation was slow, and some plants were looked at for better than 10 years of bloom. The past 5 years have had better growing conditions with some rather unusual fluctuations (wet, cool, early spring time) that have revealed other problems, mostly disease related weaknesses. The better growing conditions have allowed us to look at a plant for as little as 4 or 5 blooming seasons before making more final decisions. Usually after 3 years of bloom the selected keeper plants are divided for the first time. Sometimes the division process reveals weaknesses as well. Some plants don't easily divide or grow poorly after division (or even die). While it is sad to see a good selected seedling do poorly after division, it does reveal a weakness that must be considered before introduction." 16. How do you come up with the names for your peonies? "Naming peonies is a fun task and is quite different than naming daylilies. In the daylily world it is quite acceptable to choose risky names or those on the edge, while the peony world would prefer more elegant and respectful names. Reiner Jakubowski was quite helpful with this. I like to name my plants after places or things that have invoked a pleasant memory. Example: 'Manchurian Promise' …reminds me of the Manchurian Apricot bloom color in the spring and makes me think of that region of China with them in bloom. Generally we'd like to pick a name that others would like to see in their gardens." 17. 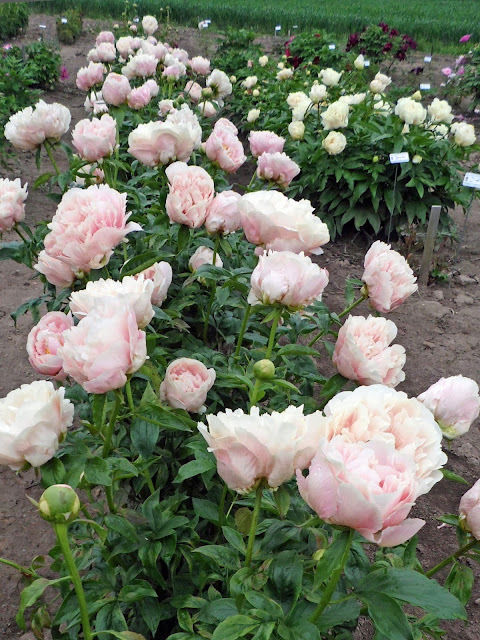 Which of your peonies have proved to be the most popular with the public? Were any of these a surprise? "This year I think 'Aegean' surprised me the most. The plant ended up being in high demand and sold out very quickly. 'Aegean' is a huge light pink double that fades to white and presents its bloom in excellent fashion. When I registered it I had never gotten seed or seen good pollen on the plant (8 years of watching and trying). Well this year it proved me wrong on both fronts. Good pollen was produced and lots of seeds on its multi-carpeled flowers. What a pleasant surprise. I sell many of my new introductions to hybridizers, and I doubt that many were interested in 'Aegean' due to its presumed infertility. Well now that one can be added to the fertile list of woody peonies. I guess this brings up the question: How long does one wait to register a peony? Probably the most popular peonies we've registered have been 'Angel Emily', 'Vanilla Schnapps' and 'Pastelorama' all mention prior to this." 18. What excites you about other hybridizers programs? "As hybridizers we all build our own programs on the shoulders of those who preceded us. I'm thankful for all of the hard work prior to our work with peonies. Some exciting break throughs have been made recently by Hans Maschke of Germany with the tenufolias. I'm looking forward to incorporating his work into our early blooming types. 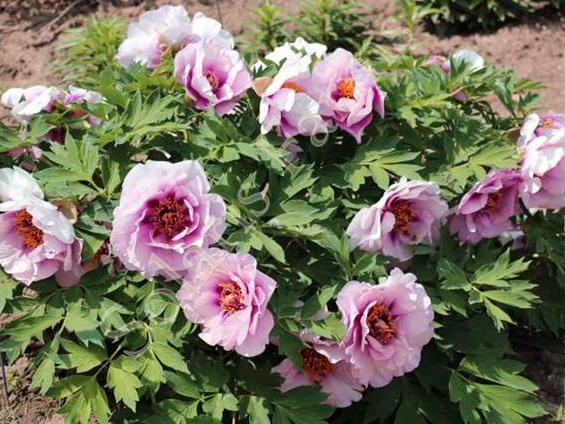 Many new hybridizers are starting to pop up in the peony world, and it will be interesting to see what they come up with. I know that many are working with Saunders' hybrids and are making some interesting gains, and I'm looking forward to the increased fertility of these new hybrids." 19. Has the pleasure you have taken from the world of peonies changed and evolved over the years? "Growing, hybridizing and the enjoyment of peonies has certainly evolved over the years. In the early years I was certainly more interested in large showy flowers and generally ignored the beauty of the plants themselves. Now plants are easily as important as the flowers in my eyes. I also have come to enjoy all aspects of growing and propagating the plants. Dividing herbaceous plants is not a particularly enjoyable job, but grafting the woody peonies has become something that I look forward to each year. 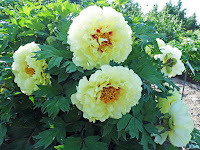 Since woody peonies, especially lutea hybrids, are not readily available and propagated, the concept of producing more for the American public to enjoy is exciting. Grafting the scions to herbaceous nurse roots in its self is an enjoyable activity and the entire process of healing them and growing the grafts is rewarding. There is nothing like seeing a three year old grafting bed, with 50 to 60 different cultivars in full bloom in a concentrated area (kind of like a candy shop with many flavors and colors). The grafting of woody seedlings for the first time brings much excitement for the future and keeps me thinking of what is to come. The same could be said for dividing herbaceous seedlings for the first time. Will these plants become large beautiful clumps? Will they behave similarly after division or grafting? Are there possible new generations that will arise from the newly propagated plants? Will people like what my eye sees as pleasing? Will these become nice show flowers in a cut flower display (something I experienced for the first time this year)? Who will begin to use these plants in their hybridizing programs?" 20. 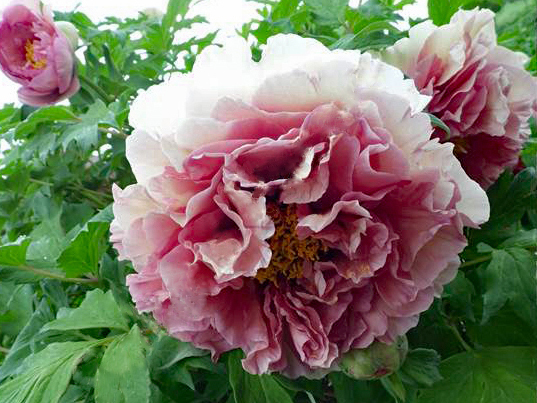 What would you like to say to newbies just getting into the world of hybridizing peonies? "Start out with some basic crosses first that will keep you interested in the first couple of years. Difficult crosses (intersectional or low fertility crosses) can be frustrating and may dampen the experience initially, so start with something that will produce seeds that grow. Growing the seed and seedlings is rewarding to see the fruits of your efforts over the first 4 to 5 years and will keep you trying new crosses. Once you have the basics down, try more difficult crosses that are more unique. Growing too many lactiflora, suffruticosa, or herbaceous hybrid seedlings can begin taking up space with plants that are not likely to produce new and interesting flowers. Don't be afraid to be creative. There is much information that says it can't be done-only to be disproven later on. If you have questions, it's helpful to find a hybridizer or someone else who enjoys the activity to bounce ideas off. I have a number of friends that enjoy the activity of hybridizing, and it always fun to hear what they are doing and develop new ideas. As much as we'd like to think hybridizing is scientific, it is equally artistic. I think hybridizing is a great learning experience, as well as a long term recreation that can be carried on at any stage of life. I do have to admit, I wish I had started early in life."